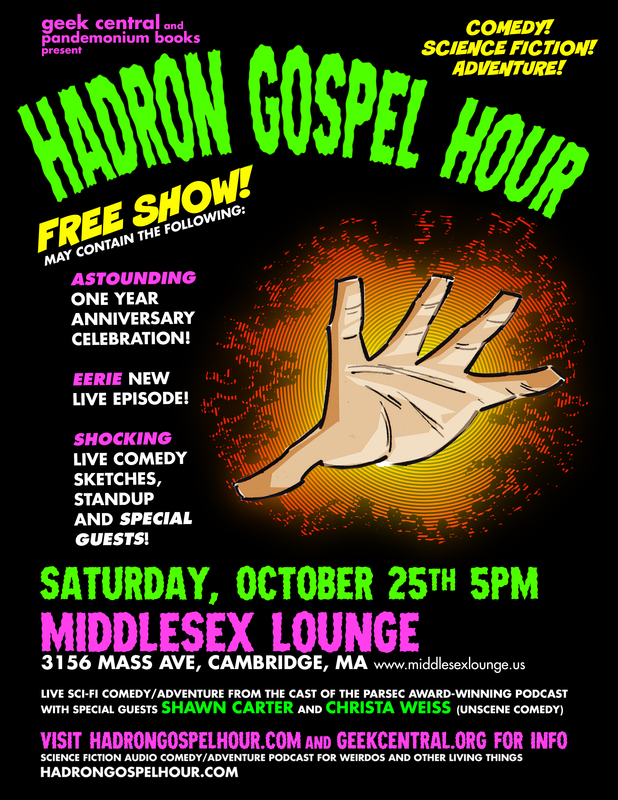 FREE Hadron Gospel Hour LIVE Show October 25th! Attention Boston-area Hadronauts! Geek Central and Pandemonium Books & Games invites you to join the creators and cast of Hadron Gospel Hour for a FREE evening of LIVE sci-fi comedy/adventure antics! Celebrate our first anniversary with a BRAND NEW, LIVE EPISODE of HGH — plus, live ‘Tales from the Hadron Rift’ sketches and standup from special guests Shawn Carter and Christa Weiss (Unscene Comedy)! This is an early evening show from 5pm – 7pm — after which we will most likely be heading to Comicazi‘s FREE Halloweeniversary party up the street in Somerville! So c’mon! See some comedy, then hang out with the Hadronauts! Once again, this is a FREE event! We’d love to see you! Does quantum comedy go well with adult beverages?